Do you have an old faded and battered photo that you cherish? Let us restore it for you. Using special tools in Photoshop, we can remove creases, tears, and spots. We can restore color or add sepia tone to black-and-white photos and improve contrast. See below for an example final product. If the image does not require extensive editing, this work is included in the price of the print. Otherwise we will quote the work before starting. 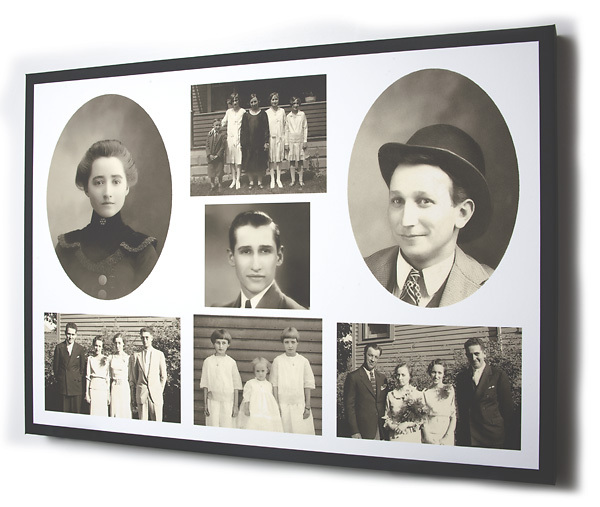 The image for the print shown below was assembled from several old photos. Each photo required major editing to remove fold lines, spots, and tears and to improve contrast. Sepia tone was added to the assembled image before printing on fine art paper and mounting with the Box mount.